TOKYO -- 20 June 2018 – Didier Seminet, President of the French Baseball Softball Federation (FFBS) participated in a first-of-its-kind observer program of a three-day Japan versus United States All-Star Series at the Tokyo Dome, Shellcom Sendai and finally at Fukushima Azuma Stadium, one of the baseball-softball venues of the Tokyo 2020 Olympic Games. FEBS President Didier Seminet caught up with his close friend Yoshio YOSHIDA (84) at the Tokyo Dome and reaffirmed each other the key elements for baseball/softball to remain as Olympic sport at the 2024 Paris Olympics. Yoshida managed the Nippon Professional League’s Osaka Hanshin Tigers 3 times (1975-1977, 1985-1987, 1997-1998) before heading off to France in 1989 to manage its National Team. He is a Hall of Famer shortstop of Tigers and a highly popular TV commentator and columnist in Japan. 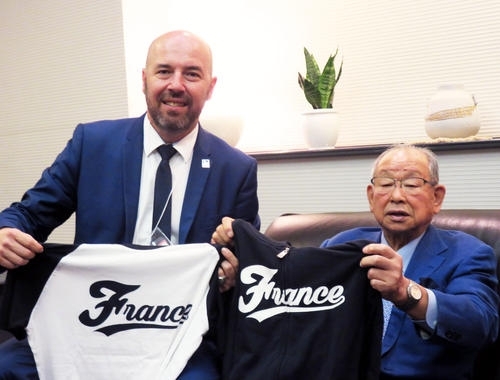 On June 19, FEBS and The Japan Softball Association (JSA, President Hiromi Tokuda) signed a Memorandum of Understanding (MOU) with JSA pledging to support the French national team's continued development and the long-term expansion of softball in France. World Baseball Softball Confederation (WBSC) Secretary General Ms. Beng Choo Low, who attended the MOU signing in Tokyo, said: "This spirit of collaboration between world-leaders like Japan and up-and-comers France is hugely encouraging, and characteristic of our inclusive, global sport. The WBSC is building a billion-strong global baseball-softball community, and growing our sport across Europe is an absolute priority for us. We hope to find many more opportunities for cooperation between traditional baseball-softball powerhouses and emerging nations in the future." Ms. Taeko UTSUGI, JSA Vice President was also in attendance of the MOU signing.